It's been a long slow week of putting boards down on the deck. It would be faster if we didn't have other commitments, but that's how it is when you do your own work. Things go slower than you might like. 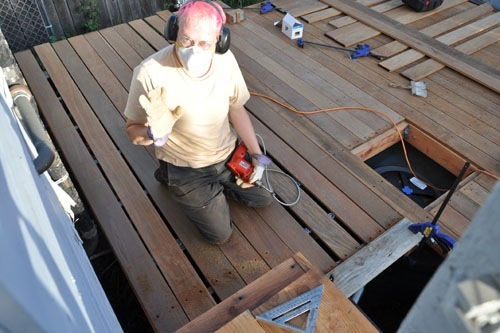 On Monday Noel began putting boards down on the stair side of the tank hatch. Here they are all predrilled and ready. And then he moved on to the other side. This evening when I left to go see some friends, he said, "I am going to finish putting boards on this surface tonight." He wasn't quite done when I got home. In fact, he ran out of screws. 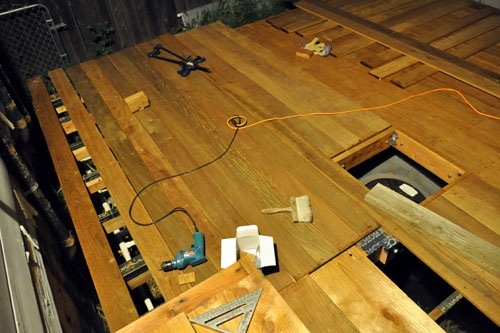 We knew we didn't have enough for the whole deck, but it almost looked like we might make the whole top surface with the one 5-lb box of screws. Not so much. 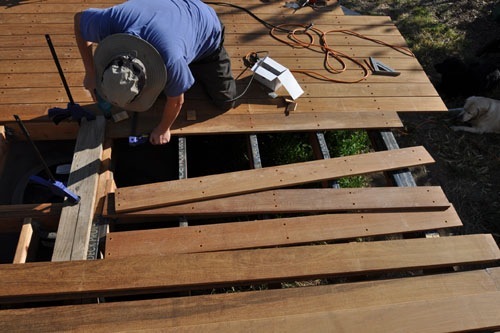 Enough boards are in place for us to do the stair stringers this weekend. Or sooner, I guess. But there are still more screws to obtain and lives to live and that sort of thing. 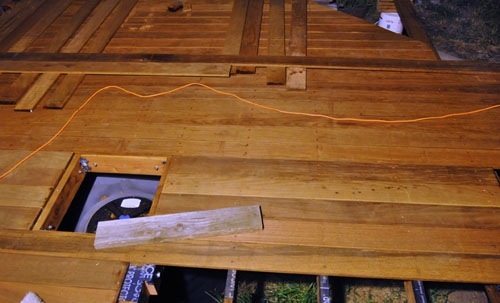 I admit that both of us are just ready for this deck to be DONE and useable, but I am determined that nobody die in the construction process. 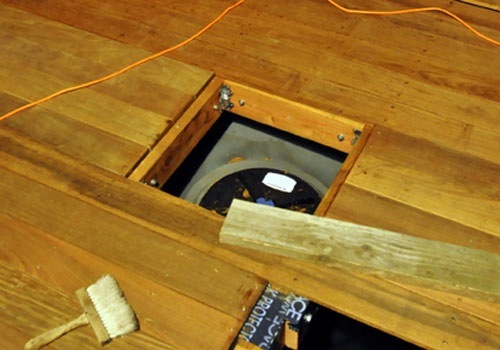 What's kind of amazing is how the hatch for the tank turned out. We placed the framing for this based on the location of the tank opening and nothing else. We could not have chosen a more perfect location if we had painstakingly measured and suffered over it. This was PURE DUMB LUCK. Wow. I think you have made progress. If you had measured and planned for the opening, in most cases, it would be in wrong place. When all you have is dumb luck, take it.